Drome was founded in the early 1990’s where it began as a men’s fashion store, in the heart of Liverpool. The company has always focused its efforts on delivering high quality, designer premium menswear, as word of mouth spread so did the popularity of Drome and soon it became the number one destination for the fashion hungry across England. 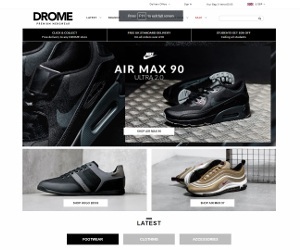 With the recent boom in designer brands, Drome is at the heart of everything, selling only the best sportswear and casual attire. They have shops in Liverpool, Manchester and Glasgow. Footwear is Dromes biggest strength, they have a wide selection of hand chosen sneakers that are cutting edge and ahead of the fashion curve. Products from Nike, EA7 and Adidas all feature heavily across Dromes premium offering.